"This recital was impressive. 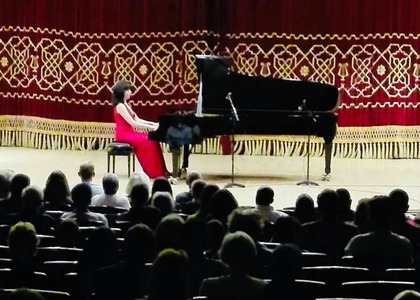 Even if the hall wasn't full, Luiza Borac filled it with emotion and depth - a very talented pianist. Her way of playing the piano is breath-taking - a perfect technique and an extremely sophisticated and exquisite colour of sound." "This was a celebration of music for me as well, and a joy of the heart because the repertoire was very beautifully chosen together with the "George Enescu" Philharmonic Orchestra. The Emperor Concerto by Beethoven is the musical summit that every pianist aspires to conquer. It was a very demanding, but not impossible task; for me this was a great joy to play alongside such a wonderful orchestra. I really enjoyed the association of these pieces by composers, pianists and great soloists who were fascinated by the Viennese Waltz - the most beautiful dance that became internationally recognized." "She has an exceptional talent, and a musical and stylistic intuition that doesn't fail. And, as you can see, this was a very original recital with pieces that do not normally exist in the program of the piano recitals; this is a Viennese music recital with pieces that are very rarely performed in concert halls in Bucharest. It is about Mozart's variations on a theme, Schubert's Ecossaises and German Dances, Fritz Kreisler's works, and about the reinterpretations made by Rachmaninoff...in any case about Godowski, about "accessibility" music of great sophistication. Luiza Borac manifests once again a stylistic culture combined with great finesse and refinement and a culture of the sound adapted to the music she offers us."